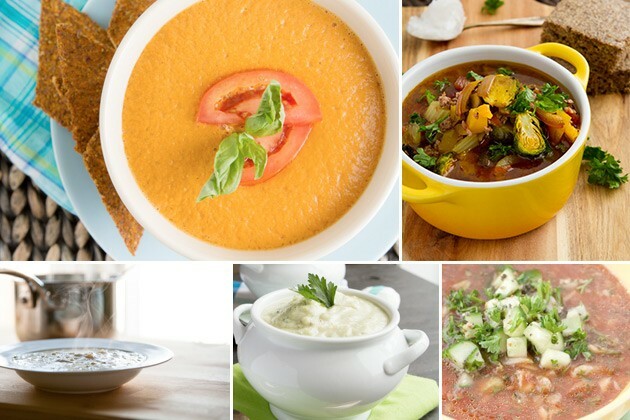 8 paleo, keto, grain-free, dairy-free and low carb soup recipes that the whole family will love, regardless of their eating style. 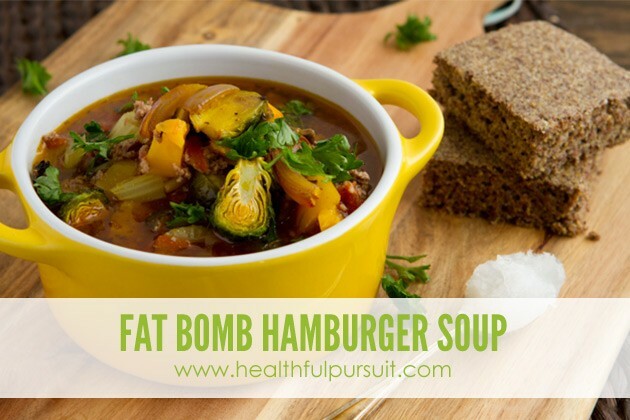 Plus, a new recipe for Keto Fat Bomb Hamburger Soup. There are few things that I love more than a warm bowl of keto soup on a cold day. If approached correctly (no need to confuse “correctly” with taking oodles of time out of your day), soups can deliver some serious keto nutrients, effortlessly. 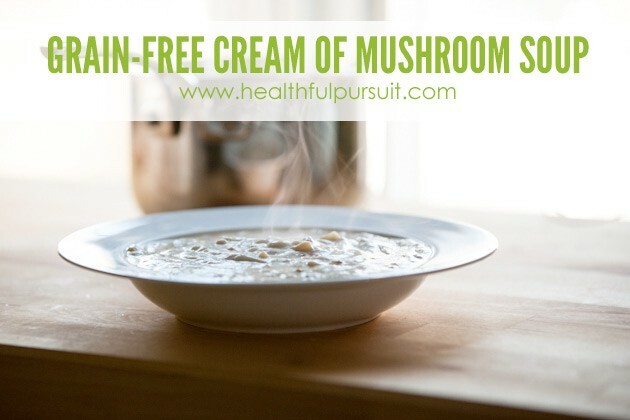 The problem with conventional soups – think: the creamed soup at that cafe you really love, is that many of them hide some pretty funky (nasty) ingredients. Vegetable oils (increases inflammation), low-quality dairy (encourages disaster pants situations), starches (gives you the nasty sugar lows followed by insatiable hunger), the list goes on. Making healthy, low carb, keto soup that won’t sap your energy is easy – a couple of fresh ingredients, a blender, stove top, that’s it. Don’t have a blender? That’s okay. Let’s not get too fancy here. The first key to making healthy, keto soup is in the ingredients. The Environmental Working Group classified common soup ingredients like bell peppers, kale, carrots, summer squash, tomatoes, mushrooms, cauliflower and onions as being the most pesticide rich crops in North America. In this case “rich” is not a good thing. 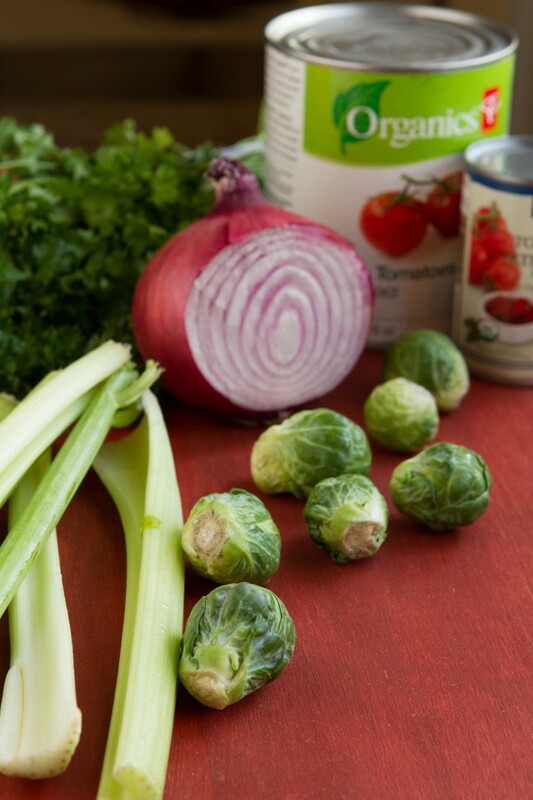 If your keto soup has any of these ingredients, go organic. And, choosing grass-fed (and finished!) red meat goes a long way in providing your body with omega-3 rice fats, vitamins D, K and more carotene than an equal amount of carrots. For chicken, opt for soy-free, corn-free, pasture raised chicken whenever you can. The second key to making a healthy, keto soup is in the preparation. Burned or blackened vegetables or meats cause havoc in your body. In fact, charred food has the same carcinogenic compounds as cigarette smoke! There’s no need to over-cook your healthy, keto soup ingredients. Cook until firm-tender and dig in! You’ll get the most nutrients this way. Macadamia nuts are what makes this soup so creamy and delicious. 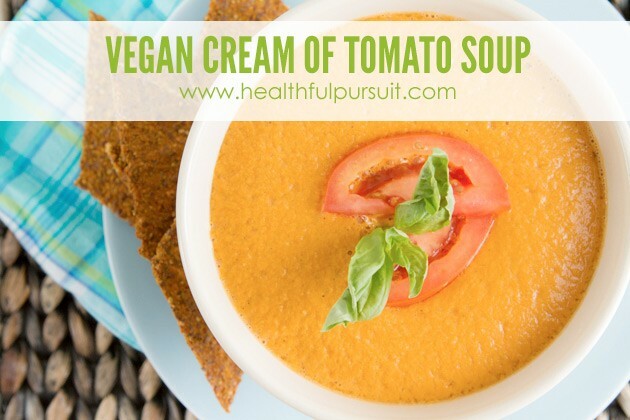 Made of raw, keto ingredients and blended, many of the nutrients in this soup are left in tact. Served best with a side of Homemade Keto Thyme and Onion Crackers. My husband came up with the idea of using blended cauliflower as a base for keto soup. Brilliant man he is. 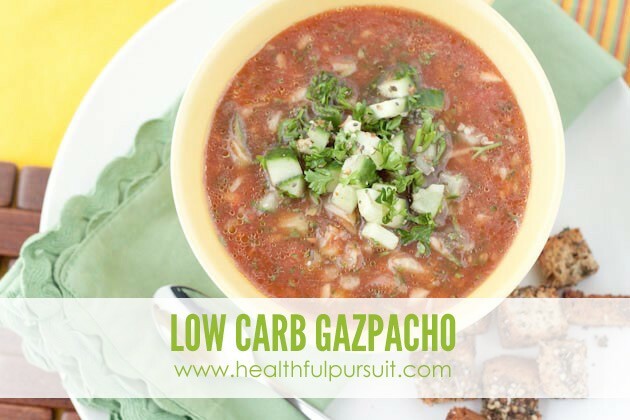 The recipe for this low carb, keto soup couldn’t be simpler. Just a couple of keto ingredients, all whole food-based. This keto soup has everything you need to stay hydrated, fueled and on top of your game. 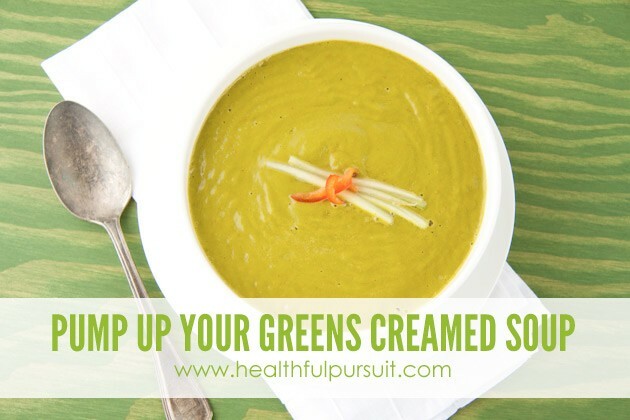 Luscious greens blended with health-promoting fats. It’s health, in a bowl. 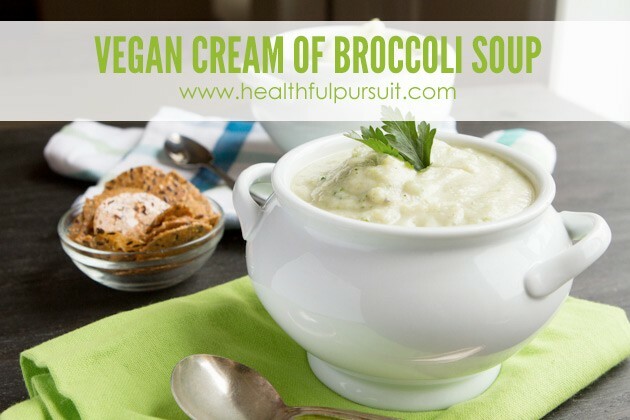 Another dairy-free cream keto soup for the books. With just 11 grams of carbs per bowl, you can rest easy knowing that the healthy fats you’re pumping in your body will go to good use. 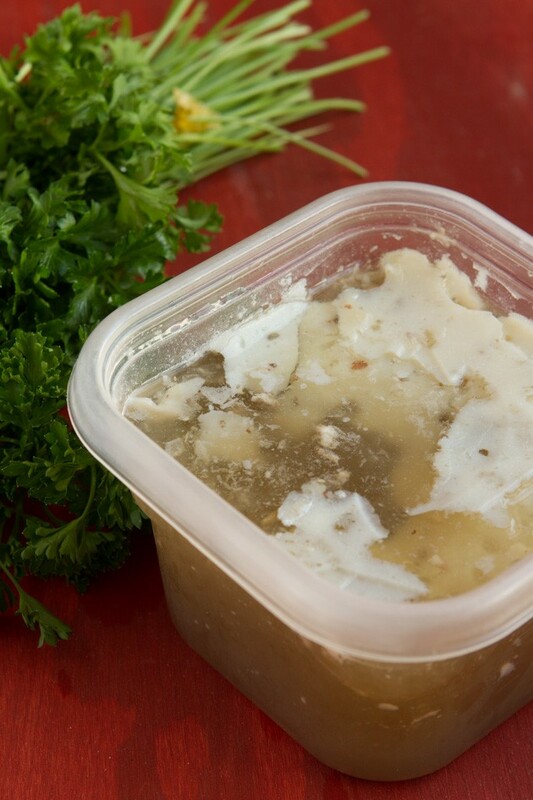 Amp up the nutrient value by using homemade beef broth in place of vegetable broth. More greens! 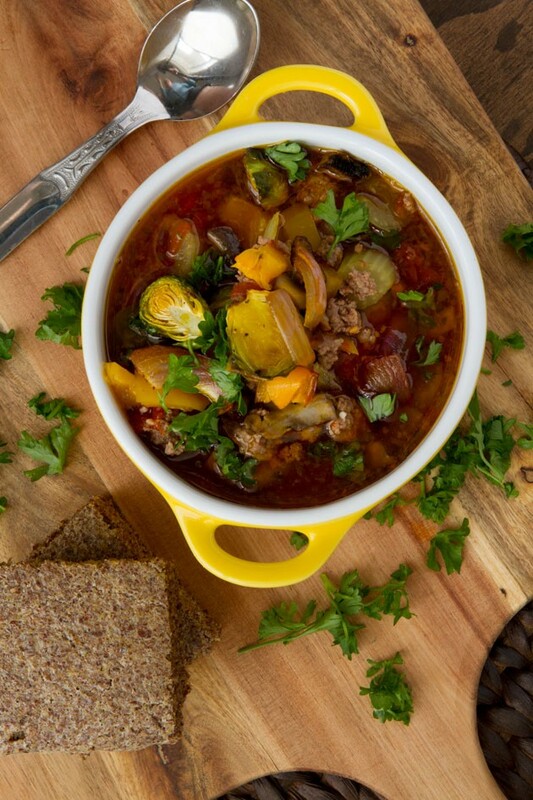 If one of your 2015 goals is to eat more greens, this stew has you covered. You won’t even taste the sea vegetables. Sounds scary? I promise it isn’t. 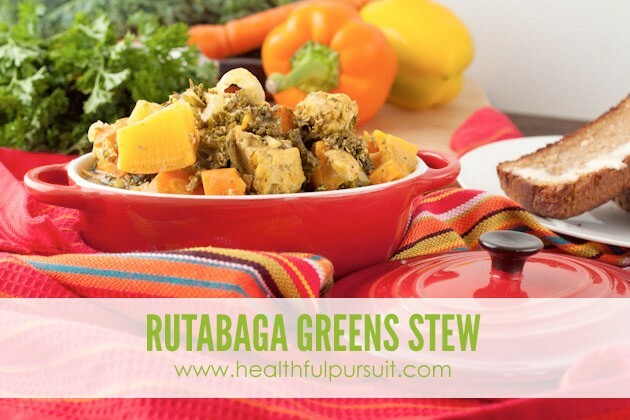 The rutabagas add crunch without the potato sugar-high, you’ll be in keto stew loving heaven. If fresh is the name of your game, this soup is your kinda party. 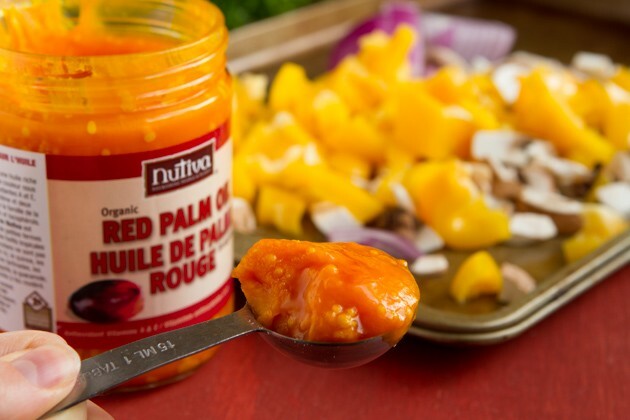 Made with raw ingredients, this vegetable-based soup is great on its own, or used as a meat marinade. Yes, I just suggested you soak your meats in this soup! I created this keto recipe a couple of months ago, before I underwent surgery (it’s all good, I’m fine!). I’m convinced that the high concentration of fats paired with the collagen from the homemade beef stock was the catalyst for my phenomenally fast recovery. 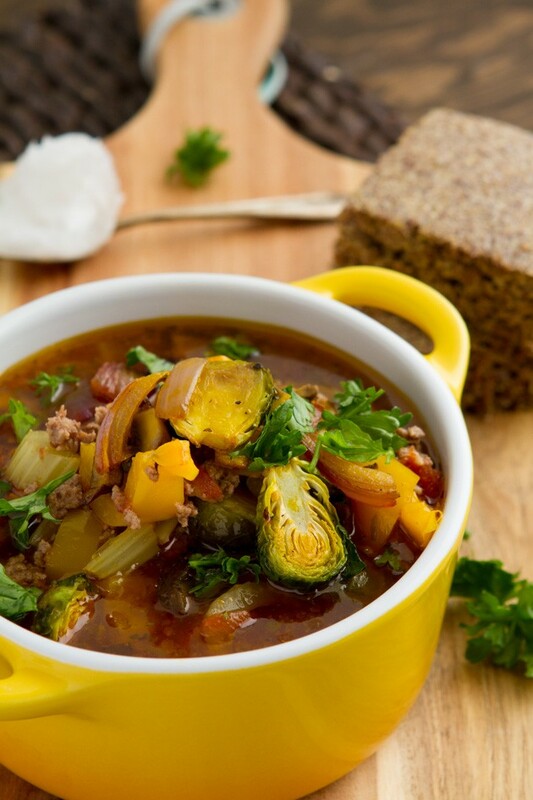 High-fat, keto hamburger soup recipe, loaded with fresh vegetables. Low carb, paleo, keto, and dairy-free. Preheat your oven to 350F. 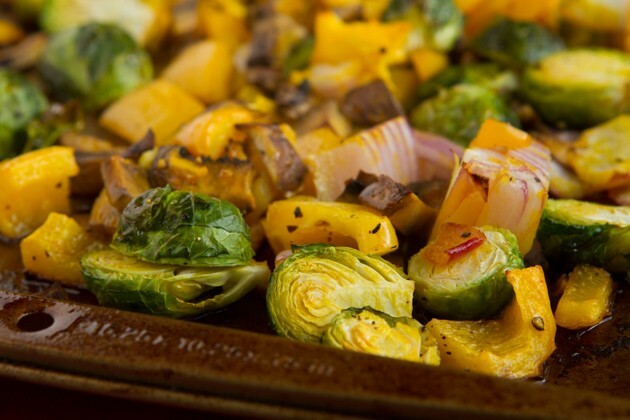 Place onions, mushrooms, bell pepper, brussels sprouts, palm oil, salt and pepper on a large baking sheet. Transfer sheet to the oven and roast vegetables for 25-30 minutes. Once complete, set aside. 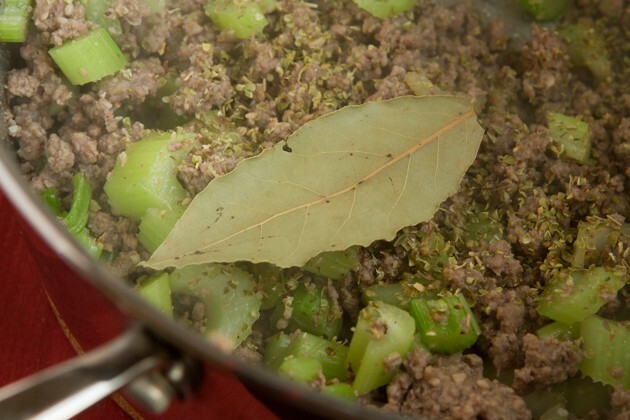 Add ground beef to a large soup pot and cook on medium-low heat until just cooked through. Add garlic and celery, cook for another 3 minutes. Do not drain the fat, keep it in there. Add remaining ingredients: stock, tomatoes, paste and spices. Bring to a boil, reduce heat to low and simmer for 15-20 minutes. Stir in roasted vegetables and chopped parsley. Serve with a slice of Flax Focaccia. I used red palm oil in this keto soup recipe. It’s another healthy saturated fat, my favorite saturated fat for roasted keto vegetables. As I mentioned above, be sure to use grass-fed and finished ground beef in this keto recipe. The fats are highly nutritious. 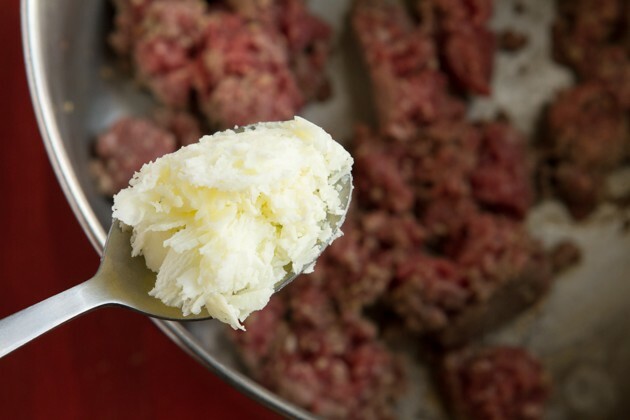 If you can’t get your paws on grass-fed beef, replace the regular ground beef in this keto recipe with lean. Animal fat holds toxins. 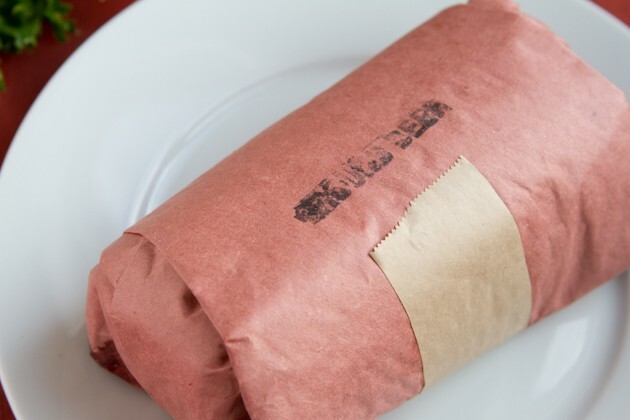 If you’re eating conventional meat, there will be toxins in its fat. I added a bit of extra homemade grass-fed tallow to the keto mix… you can do that as well, especially if you use a leaner meat. My homemade beef stock is very thick and has oil on the top. I threw it ALL in there. Once the meat is cooked, spices can be added. 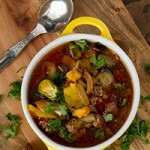 The brilliantly golden roasted vegetables are best added into the soup at the very end, for extra crunch! 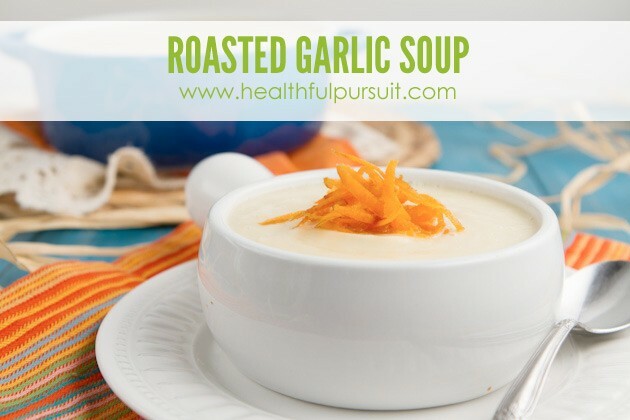 Which Healthful Pursuit soups have you tried already? What did you think?